Our project is a novel hand held controller in which we use an accelerometer to wirelessly control the motion of a Parrot AR Drone Quadricopter. The main idea of our project was building a cool glove controller for a flying platform, a quadrotor in this case, which would give the user a different sense of power over the robot, unlike conventional controllers like the Xbox controller. Even though this is an ambitious project that aims to make a moderately good controller, it can open the way to further development for this type of controllers for flying platforms. This is another reason for using a quadrotor from the Robot Learning lab. One of the team members(Mevlana Gemici) is merging this project with his project and research in the Robot Learning lab which is administrated by Prof. Ashutosh Saxena. This also allowed the quadrotor to be kept out of the budget considerations. Background math: Other than very simple math, we didn’t need to do many calculations for our project. In fact, other than integration (very simple summing in time steps) in the receiver end, there is nothing worth mentioning. We utilized the ATMega32 microcontroller in our program. 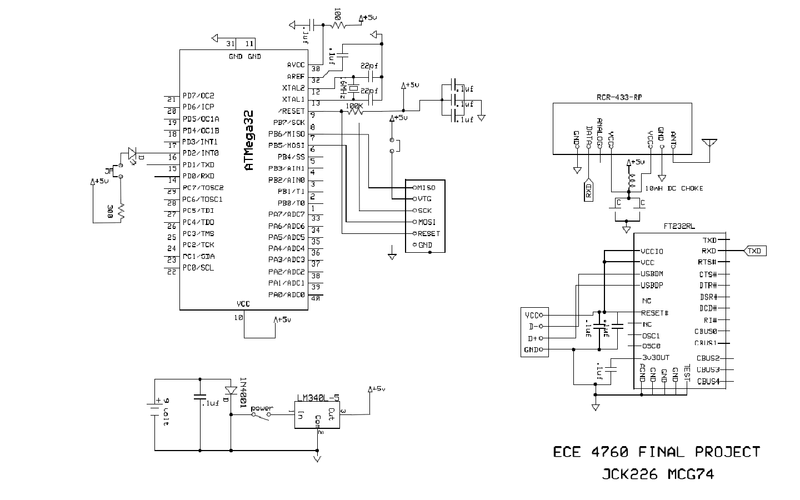 Although we initially wrote our code for the ATMega644 microcontroller, we switched to using the ATMega32 chip, as it required only changes in registers names in the ATMega644 code. We took care to select parts that were available in DIP packaging, so we could solder on to a prototype board. Since we did not ask for any samples, we cut the budget fairly close. We already had several of the necessary items – the gloves and battery connectors/converters available so we did not count that in the budget. The accelerometer we chose was the ADXL335, which including a breakout board, we obtained for $20 from Adafruit. Our choice of this module was motivated by several factors. We needed a low-G accelerometer, since the acceleration that is being detected would not be too great, as our application would be controlled by a user moving his/her hand. Furthermore we wanted movement in the x, y, and z directions, and therefore we needed an accelerometer that can sense movement in all three of these axes. Furthermore, the accelerometer must be both low cost and available on a breakout board, as the cost of a PCB would definitely cause this project to run over-budget. The accelerometer runs on voltage supplies of 1.8V to 3.6V. We opted to use 3.3V regulator along with a separate 9V battery to power the module. Initially we attempted to use a simple op-amp voltage shifter to shift the 5V from our microcontroller power supply to the 3.3V needed. However, the supply voltage provided by this setup proved to fluctuate quite a bit, causing the acceleration values from the accelerometer to fluctuate along with it, making it difficult for us to detect when it was actually accelerating. Therefore, we decided to swap to using the 3.3 V regulator and a separate power supply altogether, despite the increased weight of the extra 9V battery. This resulted in much more stable accelerometer readings. We oriented the accelerometer such that the x axis was indicative of forward/backwards motion, the y axis indicates right/left motion, and the z axis indicates up/down motion. Therefore, at rest, there is 0g acceleration on the x and y directions, but there is a constant -1g on the z axis caused by gravity. At 0g acceleration, the voltage present on the outputs from each axis should be Vs/2, where Vs is the supply voltage provided to the accelerometer, which is 3.3 V in our case. 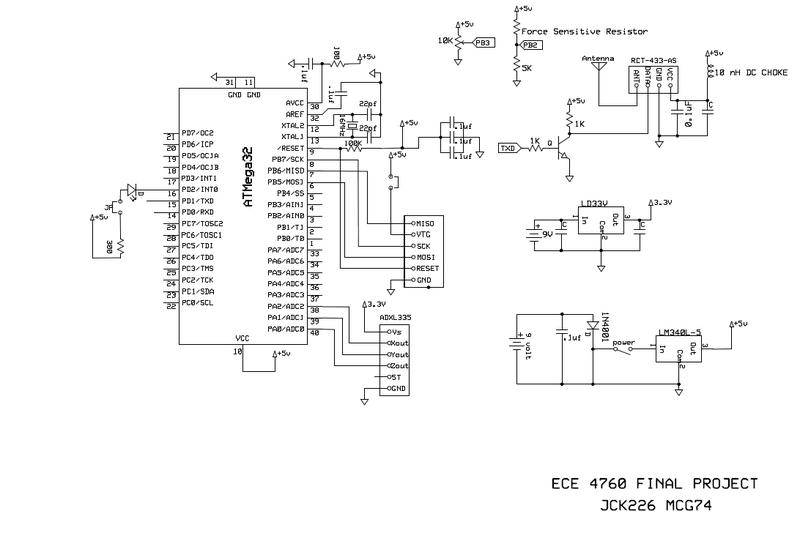 To acquire data from the accelerometer, we used the internal ADC in the microcontroller. The analog signals were connected in single ended channel configurations as follows - the z axis was connected to AD0, the y axis to AD1 and the x axis to AD2 of the microcontroller. As the ADC can only read one analog channel at a time, we used the internal multiplexer in the AVR to switch between these three ADC channels. The ADC value is read in the ADC interrupt service routine, which is called when the ADC has finished reading a value. We read all 10 ADC bits- that is from both the ADCL and the ADCH registers - but in retrospect, we only needed to read 8, as we ended up discarding the two least significant bits in order to compress the data to 2 bytes, as we can only send a limited amount of bytes in each data packet from the transmitter to the receiver. More on this will be elaborated in the section on wireless communication below. Once the data was acquired at the receiver microcontroller, we output information acquired from it to the PC in a very specific format. Instead of sending the ADC values directly to the PC, we chose to send the change in the ADC values – that is, the change in the acceleration. While acceleration can be obtained by subtracting the rest position ADC value from the newly acquired ADC value, if we hard coded the ADC rest value in, it would confine the user to start at a very specific accelerometer orientation, and therefore would probably not be suitable for use on a glove one would be wearing. Therefore, we chose to send the change in acceleration. Doing so made determining direction of motion slightly harder than it would have if we simply passed in acceleration data because then it would have been possible to perform Euler integration to obtain a rough velocity value. The format in which we sent data into the PC is as in the picture below. X1 is the tens digit of the change in x acceleration and X0 is the ones digit. XDIR is 1 if the change is positive, and 0 if there is no change or it is negative. The same applies to Y1, Y0, YDIR, Z1, Z0, and ZDIR. Squeezed is 1 if the force sensor was toggled on and 0 if it is toggled off. Each data string starts with # and ends with * for easy identification in parsing. The force sensitive resistor we used was an Interlink 402, purchased from Adafruit Industries for $7.00. We utilized it in a similar fashion as the pushbuttons in lab 2 and therefore used a debounce state machine. The variable squeezed is 1 if the force sensor is pressed. We use the circuit in the below diagram to detect when the force sensor is pressed. 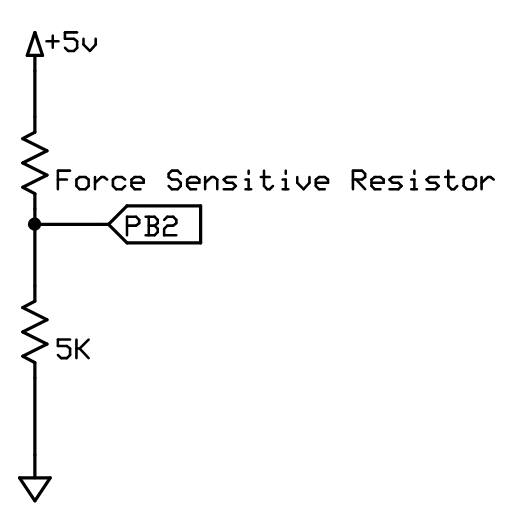 When the force sensor is not pressed, its resistance is in the MOhm range. When it is pressed, its resistance approaches a short circuit. We therefore use the analog comparator to detect when the voltage rises above a certain value by setting it to detect on rising edge. 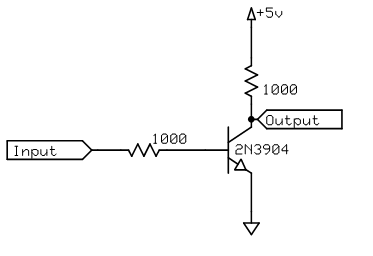 This value can be set using a potentiometer and is useful for setting how sensitive a squeeze the sensor can register. Even though we implemented the hardware as well as the software for this force sensor button, we couldn't find a good use for it since take off and landing was controlled by another mechanism. However, we are planning to use this part in further development and research on this controller in the Robot Learning lab. One suggestion that we are considering is using this sensor to toggle on/off the control to allow longer motions without having to pull back the hand while the quadrotor is controlled. This would provide easier user control as was suggested by our TA, Rohan Sharma. For the wireless communication between our transmitter unit and the receiver unit, we utilized the RCT-433-AS transmitter and the RCR-433-RP receiver, both from Radiotronix and provided by Professor Land. The communication protocol we used was heavily adapted from Meghan Desai’s Wireless Transmit and Receive Project Report on the course website. We made several modifications to it to better suit our project. The original communication protocol on Meghan Desai’s page utilizes the following method to transmit data. The full documentation for his protocol is listed in the appendix below. The transmitter sends data to the receiver through on-off keying, in which a logic 0 is transmitted by turning the transmitter off and a logic 1 is sent by turning the transmitter on, which sends out a carrier. In this configuration, the transmitter idles at logic 0. As the UART of the microcontroller idles at logic 1, the signal must first be passed into an inverter before being sent to the transmitter and the output from the receiver must then be inverted again. The inverter we used was a npn transistor placed in common emitter mode in the following configuration. Professor Land suggested using 1kOhm resistors for best performance. We were able to acquire good data at this maximum speed, but we also had some issues regarding packet size. Using the original protocol, if we attempted to transmit data beyond 6 bytes, the packet contents would end up not being received properly – e.g. the values of the bytes at the end of the packet will have changed to different values. The data that we needed to send from the transmitter to the receiver was the acceleration values for the three axes, a bit representing whether or not the force sensor was pressed, and so therefore we had to modify the transmission protocol slightly so that we could transmit all the data we needed. The first 4 bits are the 0xAA that Meghan Desai’s protocol uses for synchronization purposes and the bit 4, 202, is the start character. The ID we set such that it was 0x07 if the force sensor was toggled off and 0x0E if the force sensor was toggled on. By limiting our ID to these two specific values, we were able to use this as one of the many checks to determine if the packet we obtained at the receiver was really ours. Following the ID are the 6 bytes of data, 2 bytes each for the 8 most significant bits of the x, y, and z ADC accelerometer values. We check these values to make sure that each data char we obtain at the receiver is less than or equal to 0x0F – that is, one byte. In addition, we added one extra character, 0x0F, at the end of the packet that is used to determine if the packet we obtain is valid. Sometimes, the first several parts of the packet are correct but the last part of the packet is not. This occurs especially when the transmitter antenna is shakes. Therefore, by inserting this character to check at the end of the packet we could use it to help determine if the packet is correct. A packet of this size is around the maximum we could send – longer packets were not received properly. As mentioned previously, we initially opted to use an op amp differential amplifier voltage shifter to provide the 3.3V power supply that the accelerometer required. 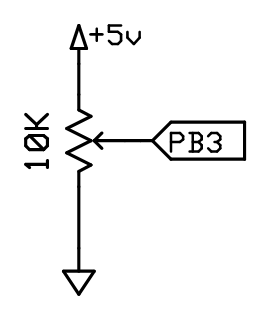 This circuit assumed that the input difference at the + and – terminals was 5V and provided 3.3V at the output. With zero input voltage, the circuit provided 0V. While this circuit did give us the necessary voltage, it fluctuated quite a lot, which meant that the input voltage was fluctuating around 5V. We verified this with a multimeter and suspect that this may be due to the transmitter. This made it difficult to determine whether or not the accelerometer was actually being moved or if the change in acceleration we calculated was due to these supply voltage fluctuations, as the resting voltage potential at each accelerometer output is determined by Vs /2. Therefore we made the decision to switch to both a separate power supply and 3.3V regulator as described previously and this pretty much solved our problem. We spent a great deal of effort attempting to get Meghan Desai’s original receiver and transmitter code to work. In the end, it took many modifications in the code, some of which do not seem immediately intuitive to get the code working. Furthermore, we noticed that it was necessary to pad data bytes at the transmitter with 0x0F or 0x00 depending on which number is being sent or the received value will not be correct. To anyone looking to use these radios and the protocol in a future project, we would like to mention that a decent amount of time and effort should be budgeted to spend on getting the radios to work properly. Another approach in this project that we tried was amplifying the accelerometer output in order to get better sensitivity. It turns out that this was not necessary and we eliminated the amplifiers from the final circuit. Even though we are not sure we have tested it to its limits we can say that the range of the radio is around 20 meters. Since we were testing the quadrotor and the radio in a room setting, we are not sure how it would behave in open environments. We used a Parrot Quadrotor as our flying platform which is connected to and controlled through wireless from a computer that runs an application code using its API in Linux. In order to interface with this application program, we used the various IO libraries provided by the Linux distribution(Ubuntu 10.10) that we were using and wrote a small driver to get the 4800 baud rate serial data from one of the USB ports. The serial port was connected to the receiver end MCU which sent the data we acquired from the RF link to the channel in a formatted way(with start/end characters) as explained previously. The quadrotor uses four propellers and has the ability to move up/down, change its yaw to turn around, move forward/backward by changing its pitch and go sideways by rolling right/left. Since we had three axes for the glove controller, we could use the force sensor as a switch between yaw and roll control. However, controlling the roll seemed quite dangerous for the robot with a sometimes unstable controller. Thus we choose to omit the roll control. Since for each of the x,y,z channels, the data that was being acquired contained some errors, either due to the accelerometer or the radio transmission, we selectively determined the data in a series of transmissions that made sense as valid to get rid of these errors. We used the x axis as the pitch controller. As the hand is moved forward, the quadrotor’s pitch is set to a value proportional to the value of the received acceleration. However since the hand motion created some immediate spikes in the acceleration data that followed the initial movement we chose to consider only the first data that is acquired after a long series of zeros. This proved to be considerably more robust for the pitch setting. Y axis of the glove controller is used in two different ways depending on whether the force sensor was activated or not. If it is inactive(0), this axis is used for setting the yaw of the quadrotor. If it is active(1), then the axis determines the sideways roll of the quadrotor. However this was disabled at the final design for safety purposes as mentioned before. The data we get from this channel is also shows some spikes but the first two data points seems to be a good indicator of the glove (instead of one data point as in the x axis) which we integrate(sum in this case) in each time step in a weighted manner and then set the motor values. This axis is used in a dynamic manner to keep its motion until a balanced motion is applied in the opposite direction since this seems to give the user a better ability to control the quadrotor for yaw. The z axis was used to make the quadrotor move vertically. After getting rid of the spikes in a similar fashion to the other axes, we set the rotor power(dgaz_final variable in the code) proportional to acceleration sum that is calculated. All the variables that we set for these four parameters are represented as velocities(sometimes angular) in these directions and take values between -25000 to 25000 which was determined by the API that was provided. Even though we are controlling the quadrotor once it is off the ground and its algorithms are activated, we didn’t attempt to change the internal mechanisms of the application and the API that uses a Xbox controller to take off, enable algorithms and auto-pilot landing since this was beyond the scope of this project. Also having a separate controller that works, allowed us to safely land the robot without any damage in case of a wrong motion command or dangerous environment. It also prevents an intruder to take control of the robot using the radio transmission since the algorithms must be enabled locally in order to send command signals that will be registered as valid. This codebase also includes that API that is necessary to interface with the quadrotor. The application program uses many concurrent treads that provides different functionalities, including sensor data processing, motor control, camera image feed processing, and Xbee control. The tread we used(planner.cpp in the codebase) was designed to run algorithms when a button on the Xbox controller is pressed and set the motor control commands according to the results of the algorithms. This provides a safe layer that doesn’t have to deal with low level mechanics of the whole system. This is the only file we changed since we didn’t need to separate our code on different treads. The serial connection driver was also implemented here using mainly the termios.h file that comes with standard Ubuntu distributions. Therefore we will only upload the planner.cpp in our project website along with a link to the original rl_codebase10 as presented above. Safety was an important issue for us, given that we were manually manipulating the movement of a decently large flying object – the quadrotor. The Parrot AR Drone Quadricopter already comes with numerous safety features – for instance, it locks its motors if one of them encounters resistance. Furthermore, it comes with a Styrofoam hull that protects it from crashes and also shielding the blades from the end user. Regarding safety considerations of our hand held controller, we performed extensive testing so that the patterns of acceleration change that correspond to the movements characteristic of forward, backward, sideways, and vertical motion can be detected properly in the vast majority of cases. In addition, we highly stress the importance of operating the quadrotor in a large open space with minimal obstructions and in its operation by skilled users. So overall we did manage to get a working setup going, however, the control was not as fluid as we had originally hoped for. The slower data rate, can be attributed to the fact that the data has to travel through two wireless channels - the radio and the wifi. So how would we do things differently next time? We would definitely use a better radio such as the Xbee, which transmits at much higher data rates and is easier to interface with a PC.By switching to a different radio, we would probably have saved much more time that could have been used to implement more hardware and send more data from the transmitter. Furthermore, we would probably be more aggressive in seeking out product samples so we would not be so close to being over-budget. In addition, we would try to use a better accelerometer control scheme. In general, the controller seems to work when used by a skilled user. Even though it is not as fluid and consistent as it can be, it seems quite promising if further development is done, which will be the case in Robot Learning lab. For this project, we heavily utilized Meghan Desai’s radio transmission protocol for the Radiotronix transmitters and receivers we used. It can be found in the links below. Furthermore, we also used the uart.c and uart.h files written by Professor Land for sending data over the microcontroller UART to the PC. This code is available on the course web site. As mentioned, we also used the AR Drone API as well as the application program that was written and provided by Cooper Bills from Cornell University’s Robot Learning Lab. We have attempted to make our project as compliant with the IEEE code of ethics (http://www.ieee.org/about/corporate/governance/p7-8.html) as possible. The part of this that is most relevant to us is safety considerations. We acknowledge that our project has the potential to be quite dangerous in the wrong hands. 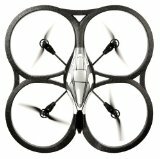 An user who is not familiar with the operation of this project will most likely end up crashing the quadrotor into other objects. We used a Xbox controller on the PC to manually take control and hand control to the glove. This way, we can avoid serious accidents from occurring. Therefore, we highly stress the importance of having two users operate this setup – one on the PC with the Xbox controller and one with the glove. Both users should preferably be well trained. We have tested the gloved hand considerably in an attempt to cause hand motions to move the quad rotor in exactly the correct direction. While this is still not 100% perfect, it is good enough that an experienced user will not encounter any wrong movements coming from the wrong movement being detected. Furthermore, we have utilized numerous checks to ensure that the receiver on the PC is receiving the correct data and not the data from another interfering 433 MHz signal. Of course, this does not solve the problem of a malicious entity with a 433 MHz radio sending deliberately incorrect data in the correct format in an attempt to hijack the quadrotor. Nor does this prevent that same intruder from connecting to the quadrotor directly via a WiFi connection and hijacking it that way. But this does eliminate incorrect data coming from the antenna being shaken and coming from other radios using a 433 MHz radio and/or the same transmission protocol. In addition, we acknowledge the fact that this project will no doubt interfere with others using the same receiver and same transmission protocol, but the chances of this occurring are considerably reduced if operated outside the ECE4760 lab. The effects of this difference on these other devices will of course depend on how well they are designed and is not something within our control. We believe that our project is in compliance with FCC guidelines. Since our project utilizes a 433 MHz radio, our transmissions fall into the 410 to 470 MHz band, which allows for low powered intermittent control signals and periodic transmissions, of which ours is the latter. Had we started this project with the intent of making sure to fully comply with FCC standards, we would have performed all calculations on the transmitter side and sent a simple up, down, right, left, forward, or backward control signal based on the ADC readings on the microcontroller. More sophisticated encryption is needed to prevent an intruder from hijacking the quadrotor by transmitting a similar signal as the transmitter. The 9V battery converters and connectors came from Justin, who had a couple of them lying around for miscellaneous projects. We tried to work together as much as we can, and usually worked in the lab together. Only the last couple of days, we decided to split up the work and focus on different tasks. Thus, these only represent whether we think one of the members did more work than the other on a specific part.